Sarah Ballard is fresh into her new position as Torres Postdoctoral Fellow at the MIT Kavli Institute. Her discoveries in the hot field of exoplanetary research have allowed her to rise far and fast in her young career, being notable for having discovered four exoplanets before she turned 30 years old, using transit-timing variation. Her work has been spotlighted in the scientific and national media including Nature, Discovery, Space, Time, NBC News, and NPR's Science Friday, and just recently she was honored with a L'Oreal Women in Science Fellowship (see News section below). Beyond her scientific achievements, however, Sarah distinguishes herself in her willingness to give back to the community in her commitment to engaging the public and in encouraging other women in science. Her personal website details her advisory roles she embraced while pursuing her PhD as a student at Harvard and later as a NASA Carl Sagan Fellow at the University of Washington. She has also developed podcasts with another astrophysicist friend, which advise on navigating and surviving science culture, and has addressed Imposter Syndrome through workshops which she shares on her website. We were able to connect with Sarah this past week to find out how mentoring has helped shape Sarah's career journey and how she feels compelled to give back. What inspired you to enter your field of exoplanetary astrophysics and what do you like best about your research? Almost everything about my academic path was an accident, from my exoplanet speciality to studying astronomy at all. I thought I'd major in Gender Studies in college, and I only took Introduction to Astronomy as a freshman because of a physical science requirement. I changed my whole trajectory to major in astrophysics at UC Berkeley because of how much I loved that class. Then, five years later as a first year graduate student in astronomy at Harvard, an exoplanetary professor reached out to me about a project he had cooking. That was for EPOXI, the first NASA mission I ever worked on, and the first exoplanet research I did. I picked it at the time because he pitched it so effectively: EPOXI might be able to detect rings and moons of exoplanets! This was so exciting to me. I was considering projects in cosmology and also in the formation of stars, but the exoplanet research beckoned! EPOXI never ended up detecting any exoplanet rings or moons-- we still haven't in subsequent NASA missions. But it was my first taste of exoplanets. Did you have one or more mentors that inspired you during your career journey? If so, what was particularly effective about their mentoring? I do have mentors! Like most women who end up pursuing advanced degrees in the physical sciences (I'm referencing the National Academies' Beyond Bias and Barriers study from 2005), I did so because people whom I respected urged me to. In contrast, our male peers tend to report that they pursued STEM careers because they felt capable, or able to make a meaningful contribution. In this sense, mentoring is a singular factor informing the choices of young women scientists. I'll focus on two instances of drive-by mentoring! I was fortunate to have very patient and thoughtful research advisors (both men), but other people, and particularly other women, played important roles at crucial junctures. In both of the examples I'm thinking of, I learned something about uniting emotional intelligence and self-awareness with ambition. I think this is why these memories were so strong and so formative. In one case, I met with a counselor at Letters & Science at UC Berkeley when I was 18. I saw her only one time, but her advice shaped my entire life. I was really overwhelmed and agitated about whether I should change my major to astronomy. I loved my astronomy class dearly: I never missed a lecture and printed star charts out in my dorm. But years of physics coursework loomed ahead, and I was concerned that I wouldn't be able to do it. She asked me to tell her "how it feels to do astronomy." I described my joy and excitement without reservation, and she replied, "that's what it feels like when you find the thing you're supposed to do." Even the fact that I could trust my own instincts and capabilities was news to 18-year-old Sarah. My second example was many years later: I was now a senior at Berkeley and was visiting prospective graduate programs. One of these programs was at the University of Washington. I had a partner at that time who was interested in his own graduate training too, in social work. The consideration of proximity to him was weighing heavily on me at the time. A professor in UW's astronomy department met with me, and asked me about how I was handling that situation. It was the only time a senior astronomer asked me about this aspect of my life, even though it was crucial to my decision-making process. She offered to call the social work department at Washington to inquire about his application, or even to ask about a scholarship for me that would enable me financially to go visit him more often. I was floored by this entire interaction. I felt that she saw me as a fully integrated human being, and not just for my capability in astronomy. She offered me a story about all of the women professors she knew, and how (to the very last woman) their male partners had made career sacrifices for them. This was the first time that anyone in professional astronomy spoke to me about work/life balance with respect to relationships, and she did it with respect and patience. I longed to be like her, and that feeling has not faded with time. Your website describes your previous mentoring roles. What proportion of your time do you spend mentoring other students? Can you describe some specific examples of when you have found it most rewarding? In the course of my academic path to date, I have mentoring stories from research angles, and from more personal angles. I'll share a story from earlier this year, when I met up with a young woman who was considering the PhD program in astronomy at Harvard. This was the program I attended. We both happened to be in the Bay Area, so I drove out to a cafe in Oakland to meet her in person. She was grappling with almost the same questions that I was grappling with when I was thinking about graduate school: she longed to have a holistically *good* experience in graduate school, and to balance her graduate training with regular life. Like me, she wasn't sure how much to trust this instinct, or whether to be purely "professional" about the decision (I put "professional" in quotes because I think well-being is an integral part of scientific productivity, so it's silly to consider them as separate things). I tried to guide her as the women in the stories above guided me: they urged me to trust my own instincts. I told her that her own feelings were deeply informative-- more informative, when all was said and done, than those of her own mentors, parents, or partners. I think good mentoring isn't about telling someone how to navigate a situation. Rather, good mentoring involves affirming to them that they are capable decision makers. These are such rich and meaningful moments to me. My absolute favorite part of my job is trying to be the woman I needed when I was younger. Whenever I feel that I have been that person for another young woman, I am filled with satisfaction and joy. Like all activities, being a good mentor is something that improves with experience. 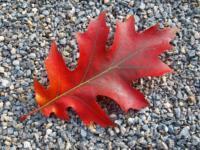 What have you found works best for mentoring? What doesn’t work? This is something I'm still learning! What I know now does not work is to commit to mentor a person when you don't have the time or emotional energy to add it to your plate. I've put too much on my plate more than once, and I think I've really let students down. It's painful to remember, which I hope reminds me to only make mentoring commitments that I know I can keep (rather than those I'd *like* to keep). You have taught workshops on Impostor Syndrome since graduate school. Do you think Impostor Syndrome can interfere with a scientist’s decision to be a mentor? What would you say to those who avoid mentoring because they think their advice would not be valuable? I think Impostor Syndrome can interfere with almost everything! It's so insidious and sneaky. To those who might be avoiding mentoring because they fear their own inadequacy, I'd say first: I totally understand that feeling. I once had to leave an undergraduate research symposium, in which three students I advised were presenting posters, because a professor pointed out that an error bar was nonsensical on one of their plots. I had to take a long walk and go sit outside, because I was so overcome with guilt about leading students astray with my sub-par research and mentoring skills!! That was such a strong impostor moment, and to be honest, I still grapple with those thoughts. The guiding principle I use in mentoring, which I think I mentioned above already, is to be the person you needed then. Did I need perfection in a mentor when I was 20? No. I needed someone who would teach me to trust my own capability, and offer praise and encouragement. Imperfection in those I admire made me feel human and sane; and as little as I sometimes worry I know now, I knew even less then! So I have something to share. I also like to remember, especially as a woman scientist: young women will be watching, no matter what. They're trying to understand the world and their role in it, and imagine what they might be capable of. I owe it to them to just try my very best, at mentoring and and everything else. GWIS Has Joined the Million Women Mentors Movement! Million Women Mentors is a collaboration of partners across the nation working to support the mission of engaging one million science, technology, engineering, and math (STEM) mentors to increase interest and engagement of girls and women in STEM programs and careers. By making the pledge to join Million Women Mentors, each mentor commits to spending at minimum 20 hours working with a mentee over the course of one year. This can include a combination of face-to-face, online, telephone, or other types of interactions. Mentors have the option of CONNECTING with mentees through the Million Women Mentors web portal with one of 58 partners representing over 30 million girls and women across the nation. This portal is ideal for chapters looking to broaden their outreach and engagement with their local community. Alternatively, mentors have the option of counting EXISTING mentorships established through their own contacts (e.g., research assistants, mentees through organizations such as GWIS, student mentees). Meaning, if you currently are mentoring a girl or woman in science, you can count that towards your Million Women Mentors pledge. All you need to do is sign up and track the pledge! To sign up as a mentor with Million Women Mentors as an affiliate of GWIS, please use the link below. You simply need to create a MWM profile and make your pledge. Alternatively, if you already have a MWM profile, please consider becoming an affiliate of GWIS by entering the following PIN in your Million Women Mentors profile: 684894302-3276. For more information please visit www.millionwomenmentors.org or feel free to email the Omega Committee at omega@gwis.org. “So, what should we call our ourselves?” It was July 23, 2014. Our then-unnamed chapter had spent most of its very first meeting electing officers, forming committees, and sharing ideas for potential networking, outreach, and social events to bring women in science together at the University of Iowa. Amy Belfi and Gina Moreno, our President and National Liaison for that inaugural year, had already put significant effort into making this first meeting successful. They had emailed women graduate students they already knew, and told us about GWIS (many of us heard of GWIS for the first time this way). At this first meeting, Amy and Gina devoted some time to describing the history, accomplishments, and prestige of the national GWIS organization. They also brought along the by-laws of the the thriving Beta chapter to provide us some initial structure. This was very useful and allowed members to make an informed decision about how we would contribute to the success of our newly formed chapter: Iota Chi. The name was chosen not only for our location (Iowa City), but the abbreviation (IX) is a callback to Title IX legislation which was key in promoting higher education opportunities for women. Iota Chi’s first year of membership was primarily filled with our peers in our departments, and one faculty member. This had the benefits of making logistics easy for our committee meetings, and we were lucky that our faculty member, Professor Julie Gros-Louis, had already been involved with GWIS. Indeed, this sparked the idea for our best Professional Development event, with nearly 20 people in attendance: Julie led a fantastic workshop on GWIS fellowships opportunities. Having a faculty mentor among the members of Iota Chi was incredibly beneficial, and we strongly recommend having a strong presence of women faculty. Of course, we had many other successful events entirely planned by our graduate student members. Our Social Committee’s events, whether picnics in the park or holiday parties at the grad-student preferred pub, always ranked highest for attendance. Our Outreach Chair, Rachel Clark, worked with our city’s senior citizen center to allow Iota Chi members to give research-focused talks to a curious and attentive audience. Our events were nicely spread out through the year – the result of deciding, at that very first meeting, which committees would have events in which month. We also decided on a shared governance system in which officers and committees would have significant access to each other’s schedules and event planning documents. This allowed great transparency and follow-through for our events, and we try to maintain that structure today. This year we’re excited to say that our members’ scientific fields are more diverse. This may partially be an effect of partnering with the Graduate College staff who routinely invite our members to events specifically for graduate students (e.g., how to write a successful fellowships application). These events are an opportunity to promote Iota Chi’s activities and the fellowships it offers. Our members certainly appreciate benefits like having easy opportunities for outreach, but as our membership among graduate students, postdocs, and faculty continues to grow, many of us feel that the largest benefit of being a GWIS member with a local chapter is the simple presence of a network of supportive women in science. As our chapter continues its second year, we are continually reminded that its success is a direct result of the time, effort, and heart of its members. Start a new chapter near you! Starting a chapter is easy and only requires seven founding members. Find out how on our website. 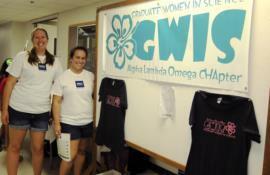 The GWIS ALO-HA chapter officers and eleven members volunteered at the School of Ocean and Earth Science and Technology (SOEST) Open House. 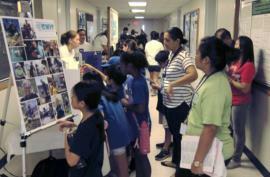 Held on campus at the University of Hawaii at Manoa, this institution-wide, biannual, 2-day outreach event attracts several thousand attendees. One of 65 exhibitors, ALO-HA chapter showcased a variety of scientific work done by female scientists from the past and present through hands-on activities, interactive demonstration, and presentations engaging elementary, middle school, and high school students. 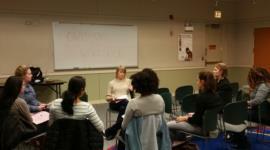 The GWIS Eta chapter held its annual CV workshop at the Near North Public Library on October 26, 2015. This workshop, led this year by Eta president Jacklynn Fitzgerald, provided an interactive discussion on how to tailor CVs for academic and research track positions in the sciences. There was a short discussion about how a CV could be formatted, organized, and developed from the perspective of faculty search committees. All attendees brought their CVs and evaluated them as the discussion progressed. Charlene McCord, treasurer of the Eta GWIS Chapter, was a panelist on the first annual Field Museum Women in Science Mixer on October 8, 2015. Roughly 60 attendees joined the four panelists for a productive and positive discussion of how to empower and promote women in diverse STEM fields. The Alpha Upsilon chapter at Auburn University hosted the 3rd annual Jr Mad Scientist outreach event on Monday, October 26, 2015. The event featured an open house appeal with 24 booths set up with scientific make-and-take projects, demonstrations, and activities. 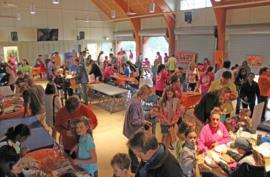 Attendees ranged in age from 4 years through 5th grade and collected passport stickers when they completed activities. 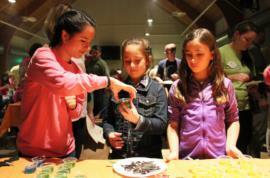 Passports were then entered into a raffle for science-themed door prizes. GWIS members sponsored the booths and mentored undergraduate women in STEM students throughout the planning and event execution. Approximately 150 attended the event. Dr. Trina Roberts has been named Director of the University of Iowa Pentacrest Museum. This includes the Museum of Natural History, which has stood for over 150 years. We also celebrate the success of Professor Julie Gros-Louis, who was recently awarded an NSF grant to study how parental responses to infants' vocalizations can guide infants' attention, and how this process affects language development. Thanksgiving is almost here, and with it the perfect opportunity to take a step back and reflect on those things that we are most thankful for (besides the gigantic portions of turkey and pumpkin pie!). In that spirit I wanted to take a moment to thank a few GWIS members who have had an amazing impact in my life. I'm hoping that my story will remind you of your own! A couple of years into my graduate school career at UW-Madison, I went through a very rough personal time and found myself a little bit lost and in need of a support system. I had my laboratory coworkers, of course, but that didn’t seem like the community I was looking for. I came across a flyer for a GWIS social hour organized by the Beta chapter, and I decided to attend. I was one of only five people there, all of which seemed to know each other very well. Despite the initial hesitation of being the outsider, Gabriella March and Tess Killpack made me feel right at home. Before I even knew it we were making plans for new activities, ways to reach more women and even attend the following weekend’s roller derby. I left that night knowing that I wanted to be a part of GWIS and in less than three months I had joined as vice president of the chapter. It was the best decision I could have ever made. The last three years of my graduate career flew by, full of great science, fun outreach activities, social hours and new friends. When it was time for me to start thinking about leaving graduate school, and knowing that I would not stay in Madison after graduation, the idea of getting involved in National crossed my mind, but I quickly rejected the thought because I didn’t think I was qualified for it. Luckily for me, Tina Hill, a Beta member that was National’s President- Elect at the time, sat me down in front of a cup of hot chocolate and convinced me that my insecurities were unfounded and that it would be a great opportunity. And she couldn't have been more right! For the past three years I have made many wonderful friends all over the U.S., I have had the chance to learn from amazing and accomplished women and to develop my organizational and leadership skills (which come in very handy when you are interviewing for a job!). And this year I have the honor to be leading this organization. I wouldn't be here today without Gabriella, Tess, Tina and many others - and so, in the spirit of Thanksgiving, thank you for what you've done for me. I hope you take a moment this holiday season to thank the people who have helped you get where you are today. On behalf of GWIS we would like to thank YOU. Whether you give advice, time, support, money, or anything else, we would be nothing without you! Your contributions to GWIS strengthen us to better serve our members. You can also donate your time by serving as an officer, as a member of a national committee, or within your local chapter. Visit our website for more information! An on-line survey of over 4,700 life scientists looked at salary comparisons between fields, age and experience, geographical regions, sectors, and gender. Findings included having a Ph.D. does garner higher salaries, biotechnology and clinical research are the most lucrative life science fields, and U.S. women earn 74% of what men do. Fortune's 17th annual Most Powerful Women Summit brought together preeminent women in business, government, philanthropy, education, and the arts for networking and exchange of ideas. One speaker indicated women too often focus on what they will lose when presented with a new opportunity and another cited career growth means being comfortable with discomfort. Of note, four out of the top five women on the list hold bachelors degrees in science and engineering fields: General Motors CEO Mary Barra (electrical engineering), Pepsi-Co CEO Indra Nooyi (physics, chemistry and mathematics), IBM CEO Ginni Rommetty (computer science and electrical engineering), and former DuPont CEO Ellen Kullman (mechanical engineering). Five female postdoctoral scientists have been awarded grants of $60,000 each for their contributions in STEM fields that include condensed matter physics, synthetic biology, and astrophysics. and for their activities to serving as role models for younger generations. Candidates were evaluated based on their intellectual merit, research potential, scientific excellence and their commitment to supporting women and girls in science. An Arizona State University study showed women actually lose influence when they allow anger into an argument whereas men's anger influences others more strongly in their favor. Do you enjoy photography? Submit a photo to be featured in future issues of the Broadcaster. Of special interest are seasonal shots that depict landmarks or geographical features special to your location, interesting patterns in science and nature, women engaged in their scientific research, and we can't get enough of women wearing our "This is what a scientist looks like." T-shirt! Send photos to Jane Sharer Maier at jsmaier@gwis.org.